Copycats of the King : Kathie Hill Music, LLC, Making music with and for kids for over 25 years! 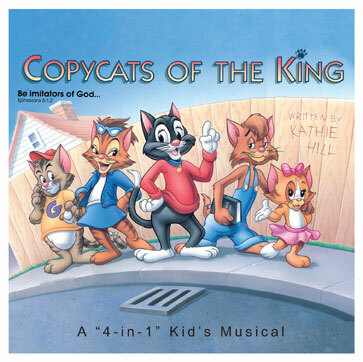 Released in 1984, Copycats of the King was a highly successful Sparrow children’s recording, but was never available in printed form until now when Kathie Hill Music obtained permission to offer this classic for performance as a full musical or four "mini-musicals." Each of the 4 stories can be performed individually or in combinations of 2, 3 or all 4, making this work perfect for shorter performances, chapel services or missions outreach with songs especially accessible for younger children with kids, teens, adults or puppets performing the speaking parts. So lead your kids to live out Ephesians 5:12 and be Copycats of the King! Listen to SONG SAMPLES below & download a FREE Coloring Sheet! Growing up, our little church library had "Copycats of the King" and I absolutely loved it. The loan card for that cassette had my name on it so much, it was ridiculous. I really appreciate the way Kathie presents such important messages in fun and moving ways that everyone can understand. I grew up listening to the Copycats and to this day I remember every song. The lessons are practical and real yet easy to understand and learn. I was so excited I found it because I LOVED IT and i am buying for my niece and nephew so they can fall in love with it too! Kathie's Note: When this project released, people loved it so much that Sparrow had to create a hand-written script and score for all the churches who wanted to perform the stories. KHM has had that transcription professionally engraved, the recording transferred to CD and a offers a complimentary color sheet. Note that the discounted Peformance DVD contains just the videos we produced in the '80's "The Copycats Meet Growlbert" and "B.C. Paws". With spilt left channel instrumentation / right channel choral vocals. (No dialogue or solos.). Downloadable pdf of all songs, script, production notes & piano transcription with permission to make 3 copies . Additional copies require purchase of additional 3x license/s. Paper sleeved CD of entire musical with dialogue and songs with 4 color F & B inserts . Performance of "Copycats Meet Growlbert" & "B.C. Paws" by a kids's choir & adult characters.